For more than a year, Google Reader has been struggling to add social features and almost all the new features were contrived, difficult to use and only cluttered the interface. 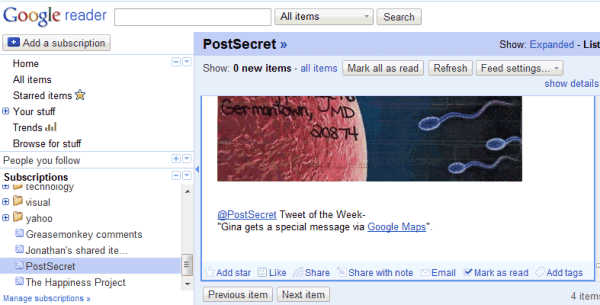 Originally, Google Reader's only social feature was sharing items in a public page. The trouble was that the shared page was difficult to find and users had to email the URL to their friends. Then Google Reader decided to automatically add your shared items to the reading list of your Google Talk friends, but those people weren't necessarily your friends and some were even added automatically by Gmail if you communicated often. Eight months later, Google Reader started to let you create a custom friend list. Sharing an item wasn't enough as users couldn't explain why the post was interesting. To make things more complicated, Google Reader added "share with note". "Use the "Share with note" button on the item toolbar to create a copy of that item with your own note attached to it," explained Jenna Bilotta. Sometimes the annotations were debatable and you wanted to post a reply, but Google Reader didn't have a commenting feature. Then comments came up and you could comment "on any items that you share or that have been shared by your friends". And since the interface wasn't complicated enough, Google Reader added a comment view to keep track of the posts that have comments. The most recent additions help you find other people who use Google Reader. For the first time, you can protect your shared items by only making them available to the people from your friends list. 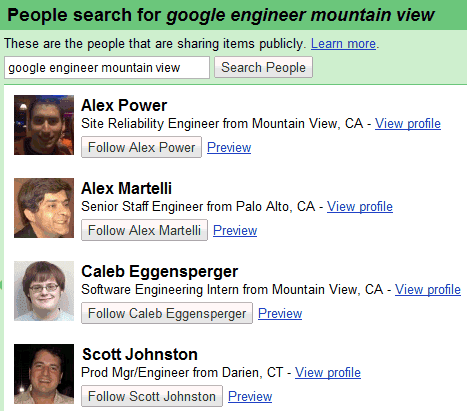 You can also use Google's public profile search to find other people who share items and to follow them. In addition to starring, sharing and sharing with note, Google Reader users can "like" posts. Why would you like a post when you can star it? By default, the starred items are private, while the items you like are public. Google Reader displays the number of likes next to each post and a list of the people who liked the post. Google Reader became more difficult to use as the new features cluttered the interface and forced you to make more decisions. Now you have to decide if you want to star an item or just "like" it, if you want to share an item or share it with a note, if you want to follow the people who are following you. FriendFeed, a service that helps you share and discuss interesting web pages, solved Google Reader's problems without complicating the interface. If your FriendFeed page is public, all your actions are visible to your subscribers. When you "like" an item, you automatically share it and you can also add a note. Unlike Google Reader, the note is actually the first comment from a discussion. User actions help FriendFeed find interesting posts, which are promoted at the top of the page. My first feeling was, they have indeed cluttered the UI. They have a good feature set. What they need is, to go to drawing board again, and make UI and UX simpler. How can I switch it off again? I'm not sharing anything, and I don't need to have a counter showing me how many people liked a post. It's only making the interface more cluttered. I am a regular user of google reader. I agree with the users comment made above. The priority should be now on UI. It can be made a lot simpler and much more user friendly. For example, why not leave the "like", "share", "edit tags" and all those stuff on the top (just above the header of a post) too. For some really length posts, I might not be interested in the embedded photos and videos. So, adding a button to read the post in only text makes my life a lot simpler. ... And what about essentials features in Google web apps, like synchronizing Gmail birthdays with Calendar... ??? Google, depite it's nice and smart, is often missing the essentials. I'm finding that I love blogs who use twitter to let us know when new posts are out, that way I don't need to use Google reader at all. In fact that's why I like this site so much : ) Twitter allows me to see what my friends like and allows me to comment on stuff easily and all publicly as opposed to facebook. Can I add to the list of Google Reader counter-intuitive features the "Blogs I'm following" section? If you follow a blog using Friend Connect, the blog's feed appears in this section, even if you are already subscribed to the feed. Feedly has done quite a bit to de-clutter Google Reader. I have started using it more and more. Appropriate buttons and links are placed correctly and it is very well integrated with Facebook, Friendfeed and Twitter. Its just a Firefox plugin. It has loads of other features. If Google Reader Team decides to simplify the UI, they must look at Feedly. I think Google Reader is awesome and I use it daily. I use a bookmarklet that lets me "share with notes" any page that I find whether there is an RSS or not. I've found it to be useful as I can then share ideas with others by adding tags and then directing them to that topic. I don't mind the additional clutter as I ignore the features I don't care about and use the ones I want. Again, I have to complain that it appears that no one is playing the role of designer at Google above the individual feature level. More than 10 people have "liked" this story in Google reader, but over in the "What's Popular" Gadget the articles with the most "pops" have gotten no higher than the twenties. Feeds I've added to my Google Reader list magically appeared on my blog, then split themselves off into a second category of things and showed up as duplicates in Google reader. I'm still haven't figured out how I'm supposed to manage these two distinct lists. Wouldn't it make more sense to manage everything I want to share with the world in on place (like Orkut) rather than add bits and pieces of social networking everywhere? Even Facebook, who's whole mission is "sharing" admits the interface that allows you to control who gets to see what is overly complex and needs reworking. Friendfeed has a lot going for it in terms of aggregating a lot of dissimilar materials from all over the Internet, but it's almost impossible to maintain a coherent conversation on any topic without getting distracted into something else. I'd like to see more tools that are mostly independent of everything else with a separate application for sharing. They've obviously put a lot of work into Reader, and use it every day. One problem remains... if I find a web page that I wish to "share", "like", or make notes about, but don't find it via a feed, the Reader features are all useless. Google Notes, Blogger, and Orkut would all be better for those tasks, but those products are either discontinued (Notes) or fading (Blogger) or fading fast (Orkut). I think the key is for Google to make a distinction between "atomic" tools (Notes, Tasks, Gmail, Docs (individually)) and aggregation tasks like Orkut, Reader, iGoogle, and the Docs file manager. *** Note I use "Orkut" as a placeholder for a mythical Google social networking product. You'd probably have to throw out the existing Orkut and start over to accomplish what I'm talking about. More than 100 people have "liked" this story in Google reader, but over in the "What's Popular" Gadget the articles with the most "pops" have gotten no higher than the twenties. Google should add a "N people HATE this" tag to every new feature. Maybe the old ones too. I personally don't care how many people have liked a post that I'm reading, I find the little smiley notice distracting and annoying, and really wish that it were somewhere else or none-existent. Yep...it's confusing now. Do I now follow someone AND add their shared items to a subscription folder? Do I share AND like? Do I share with note and comment? I realize that one feature is public while another might only be restricted, but this is getting a little ridiculous. If you simply want to share and interact with articles and comments with everyone, then GReaders features are now very confusing. I would expect the average user to scream if I was to try and explain the current design and information flow. I know I'm in the minority, but I like the Like thing. It is an interesting albeit over-simplified gauge about how many people like and read a particular RSS feed. That said, I would also back up the ability to turn that feature OFF as I can see how it could be super-annoying if you don't want clutter. To me, this feature is distracting, annoying, and pointless. I'll read what I find interesting, thank you very much. If Google wants to make a social news/sharing site, go right ahead, but don't cram it into Google Reader. If you insist on it, at least give us an option to turn it off. As someone else mentioned, the only feature Google Reader seems to be lacking is password protected feeds. Other than that, I'm happy with it. Just keep the UI simple. How do I turn the "liked" feature off? I have no intention of ever using Google Reader for social purposes, and this makes it cluttered and another step toward ruining a great product. I agree. We need a way to turn this off, or at least hide the yellow icon. I don't need the distraction while reading. Jake - you are a lifesaver. That worked perfectly! Found this thread after Googling for how to turn off the "N people like this". It's hard for me to express how much I hate this feature and even more what it symbolizes. I'm frankly very tired of everything on the Internet requiring a "social" component. Sometimes I just don't want to socialize. My time spent in google reader is sort of like browsing a newspaper. If you're reading the paper (something I haven't done physically in years), you don't want to hear what people think about the articles. If you want that, you go turn on a 24 hour news channel or talk radio. I enjoy skimming all the articles in reader to look for the true gems. If anything, I'm growing tired of reading about what "the collective" likes or thinks is interesting. This is why I have a long tail of niche blogs in my feed that are never going to make it on the front page of Digg and which would probably bore the heck out of 85% of my friends. They are true gems that *I* find enjoyable. I couldn't care less whether tomtom53 "likes" the latest posts on "In the Pipeline". It has no value to me. That said, given how many people do talk about the same topics on various blogs and social bookmarking sites, one thing that reader could add that would be awesome, is a "topic view" that would combine posts from different sources into topic groups to cut down on repetition. For example: if there's a post on Hacker News about Apple cutting off Palm Pre support, I can see the entry from Slashdot, Daring Fireball, Techdirt, etc... all in one spot. That is super-hard to do right, but Google has plenty of smart linguistics experts who can make that happen. It would provide enormous value to me in sifting through my various feeds... much more than all this social networking stuff will. I was the "X people liked this" feature disabled, I agree with most of the people above: Google reader is like browsing the newspaper. I scroll through stories and skip over most of them because they do not interest me. If google continues to add "features" like this I'll be forced to find other avenues for reading RSS feeds, believe it or not, google isn't the only place for this sort of product. Please understand my frustration is having "features" pushed on you with out any way to "opt out." This is horrible careless concern for your users. If this is the future of google then I'll also look elsewhere for all of my needs that google currently provides. You can also use Google's public profile search to find other people who share items and to follow them. May be helpful. I rarely see people promoting their "Shared Items" feeds. Though I'd rather want an option "find people who shared items that you shared". Yes I'm already google reader. Please stop with all this sharing and social stuff...enough already. I really don't care if 20 people like an article I have read, I don't want to bore 30 others with the stuff I like, I don't want to 'share' anything with people I have never met and never will meet I just want to read my RSS feeds - in peace, on my own, without distractions...please! Not only is the GUI becoming ugly, it's bad on smaller devices (netbooks &c), where this stuff is so much clutter. Time to switch blog reader again. You think there'd be an easy interface to transfer blogs from Google Reader to Blogger's "Blogs I'm Following" list, particularly as I have a Google account & both are run by Google! Stop making things more complicated & start making them simple.